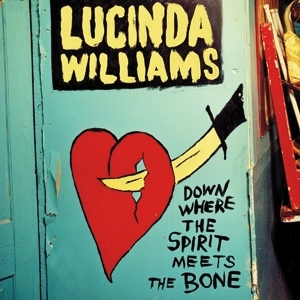 There’s something familiar and comforting about Lucinda Williams’ latest release Down Where the Spirit Meets the Bone. The straight ahead country and blues featured on the two disc set is one obvious source of this feeling. The collection is a mix of rockers and ballads about the themes near and dear to fans of this kind of music: love, loss, and hard times, with some political statements interspersed. These are songs toremind the listener that this music isn’t going anywhere, and it sure doesn’t get old. It is the creation of a songwriter who quite obviously has this sound lodged in her soul in a way that might make other records like this one fall flat. And it’s comfortable. But there are things less obvious and personal that makes the experience of listening to even the grittiest, dirtiest of guitar riffs like the one featured on “West Memphis” almost soothing to hear. The song that opens the first disc, “Compassion,” certainly sets the tone for the whole record. The opening chords and melody from the lone acoustic guitar hold echoes of that legend of alt country, Townes van Zandt. Williams seems to be channeling his melancholy tone, and it works to pull the listener into the record the way sleep pulls you into dreams. The other thing about this song is that it is based on a poem written and published by her father, Miller Williams. From the pen of the professor came the title of the record “Where the spirit meets the bone,” and Williams sings it as only she could. Meanwhile songs like “This Old Heartache” with its twangy pedal steel solos sounds like something you’d hear walking into a Texas honky tonk with a title and theme as classic as it gets, but a sound that is unmistakably Lucinda Williams’. The record keeps coming at you with Williams’ wisened songwriting in a clear outpouring of inspiration that has been three years in the making. Closing the record is a beautiful, extended cover of the JJ Cale song “Magnolia,” a fitting, final thought that once again reveals Williams’ influences and brings a personal touch to the record. It compliments the opening track in its earnestness. The list of musicians helping out on this record is long, and does not need to be detailed here. You can hear it in the quality of the music. In the end, the only thing that really needs to be said about the record is that it reminds us that Lucinda Williams is one of the great ones.